Have you ever had a friend who was afraid of death? Or did you ever know someone who was close to dying and fearful of what might happen and wanted some advice on what to do? Have you ever been at a loss for what to say to someone whose loved one had recently died? This is why this book has been written. Many people are afraid of death, or do not know how to prepare for it nor what to expect. So this book is provided to relieve anyone of the fear that often accompanies the thought of death, and to supply a means to more clearly understand the purpose of it and how we can use it to our advantage. It will also help the survivors of the departed souls to better understand what has happened and how to cope with it. Furthermore, it shows that death is not a tragedy, but a natural course of events meant to help us reach our destiny. This book is short and easy to read, with soothing and comforting wisdom, along with stories of people who have been with departing souls and what they have experienced. It is written especially for those who have given death little thought beforehand, but now would like to have some preparedness for what may need to be done regarding the many levels of the experience and what might take place during the transition. The fear of death and learning to let go. The opportunity of death: The portal into the next life. This earth and this body are no one's real home, so death is natural. Being practical and dealing with the final responsibilities. Forgiving yourself and others before you go. Being the assistant of one leaving this life. Connecting with the person inside the disease. Surviving the death of a loved one. Stories of being with dying, and an amazing near-death-experience, Drowning in an Ocean of Love. Connecting to the spiritual side of death. What happens while leaving the body. What difference the consciousness makes during death, and how to attain the best. So no matter whether you are afraid of death or concerned about surviving the death of a loved one, or are worried about those that you will leave behind if you depart, or what death will be like and how to prepare for it, this book will help you. Stephen Knapp has spent several years as a Health Care Worker and Home Health Aide. He has taken care of not only the elderly who needed constant assistance, but also hospice patients who had little time left to live. It is from this experience that he has contributed to this book, "Facing Death." He has also studied the philosophies of the world for the past 30 years. This has included directly engaging in the spiritual disciplines of the East. He has also traveled extensively throughout India, and gained a wide variety of experiences that only such places can give. This background has given him much knowledge and insights into the nature of death and dying, and the preparation for it. With these insights and background, he has the qualifications and understanding to provide a most unique and uplifting view of the natural transition called death and how to overcome any fear of it and use it for our benefit. Without a doubt, one of the most misunderstood and feared aspects of life is death. In our Western culture, we generally do not think of death (we're afraid to?) until the time comes for someone close...or our time is near. 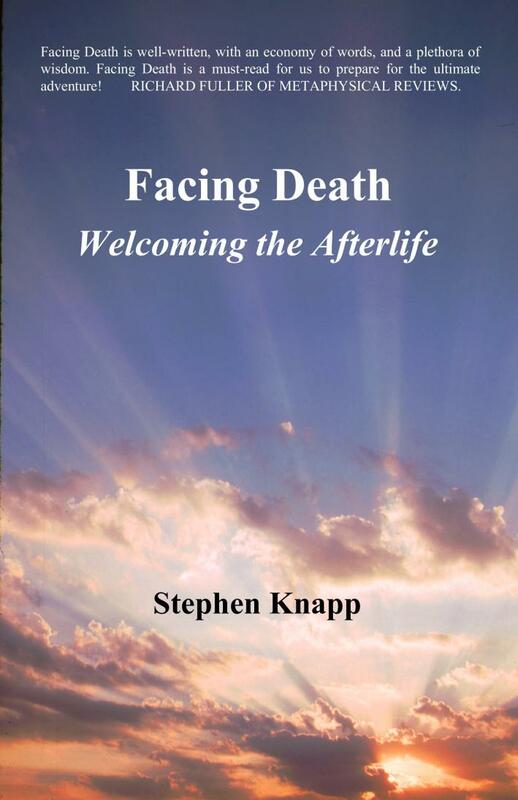 Author and seer Stephen Knapp points out that if we allow ourselves to recognize that death is a part of life...life becomes different...more valuable and more meaningful. For instance, we'd have fewer quarrels, we'd be more giving and understanding and we'd appreciate many things that we now take for granted. Facing Death, therefore, is a must-read to diminish our fears of death while expanding the pleasures of life. Stephen Knapp offers both sage advice as well as spiritual insight. "Each life is meant for us to learn more about ourselves, and about who we are." Nearing death, "...let go of any fear and let God put you where you will make the most progress." Facing Death teaches that, "...death is essentially the shedding of the body." What remains, forever, is the soul. Thus, "...death can be looked at as a great opportunity...the ultimate healing...the start of a [life] someplace else." Stephen Knapp divines that, "Preparing for death is looking into the truth of yourself. By doing this you also learn how to live." If we start preparing sooner, we learn, we have a greater opportunity to appreciate our life, and attain a high level of consciousness for the final transition. Facing Death is well-written, with an economy of words and a plethora of wisdom. Stephen Knapp has given us a book to give to people about to make the transition. In this reviewer's opinion though, Facing Death is a must-read for us, now...to prepare for the ultimate adventure!